Rectiphobia – fear of being corrected. While the media is full of stories about the obesity epidemic, there is a growing body of research showing diets don’t work and a move to intuitive eating instead. So why is it so hard to lose weight? Most of the stuff I say is true because I saw it in a dream & I don’t have the presence of mind to make up lies when I’m asleep. – Presence of Mind – © 2017 Brian Andreas – posted with permission. 1258 – Baghdad fell to the Mongols, and the Abbasid Caliphate was destroyed. 1306 Robert the Bruce murdered John Comyn, his leading political rival sparking revolution in the Scottish Wars of Independence. 1355 The St. Scholastica’s Day riot broke out in Oxford leaving 63 scholars and perhaps 30 locals dead in two days. 1567 An explosion destroyed the Kirk o’ Field house in Edinburgh. The second husband of Mary Queen of Scots, Lord Darnley was found strangled, in what many believe to be an assassination. 1763 The 1763 Treaty of Paris ended the French and Indian War and France ceded Quebec to Great Britain. 1775 Charles Lamb, English essayist, was born (d. 1834). 1798 Louis Alexandre Berthier invaded Rome. 1840 Queen Victoria married Prince Albert of Saxe-Coburg-Gotha. 1846 First Anglo-Sikh War: Battle of Sobraon – British defeated Sikhs in final battle of the war. 1870 The YWCA was founded. 1893 Jimmy Durante, American actor/comedian, was born (d. 1980). 1894 Harold Macmillan, British Prime Minister, was born (d. 1986). 1906 HMS Dreadnought (1906) was launched. 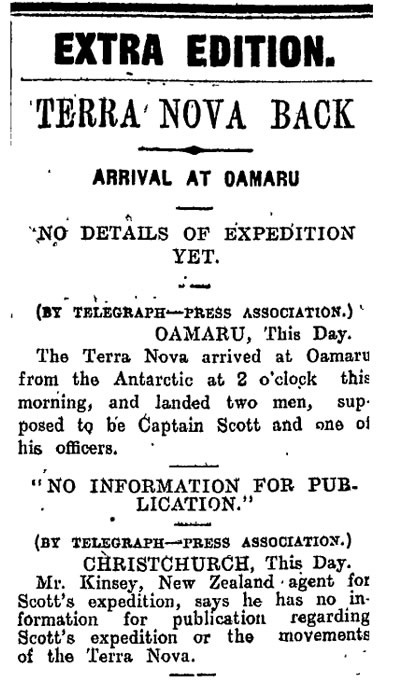 1913 – News of the failure of Captain Robert Falcon Scott’s expedition to the South Pole was telegraphed secretly from Oamaru. 1920 – Jozef Haller de Hallenburg performed a symbolic wedding of Poland to the sea, celebrating restitution of Polish access to open sea. 1923 Texas Tech University was founded as Texas Technological College in Lubbock. 1930 Robert Wagner, American actor, was born. 1931 New Delhi became the capital of India. 1933 The New York City-based Postal Telegraph Company introduces the first singing telegram. 1934 Fleur Adcock, New Zealand poet, was born. 1937 Roberta Flack, American singer, was born. 1947 Italy ceded most of Venezia Giulia to Yugoslavia. 1950 Mark Spitz, American swimmer, was born. 1952 Lee Hsien Loong, Prime Minister of Singapore, was born. 1955 – Greg Norman, Australian golfer, was born. 1962 Captured American spy pilot Gary Powers was exchanged for captured Soviet spy Rudolf Abel. 1964 – The aircraft carrier HMAS Melbourne (R21) collided with the destroyer HMAS Voyager (D04) off the south coast of New South Wales. 1967 The provision of free milk in schools ended. 1967 – The 25th Amendment to the United States Constitution was ratified. 1981 – A fire at the Las Vegas Hilton hotel-casino killed eight and injured 198. 1982 Iafeta Paleaaesina, New Zealand rugby league player, was born. 1989 Ron Brown became the first African American to lead a major American political party when he was elected chairman of the Democratic National Committee. 1996 The IBM supercomputer Deep Blue defeated Garry Kasparov for the first time. 2008 The 2008 Namdaemun fire severely damaged Namdaemun, the first National Treasure of South Korea. 2009 – The communication satellites Iridium 33 and Kosmos-2251 collided in orbit, destroying both. 2013 – Thirty six people were killed and 39 injured in a stampede in Allahabad, India, during the Kumbh Mela festival. 2016 – South Korea decided to stop the operation of the Kaesong joint industrial complex with North Korea in response to the launch of Kwangmyŏngsŏng-4. You are currently browsing the Homepaddock blog archives for the day Sunday, February 10th, 2019.